We are ardently committed to promoting the health of pollinators as an essential component to creating a sustainable food supply. Our passion for addressing this critical agricultural and environmental issue has led us to offer a line of products developed specifically to aid the pollinators. These seed mixes are designed for specific types of pollinators and are of species that will provide a full 3 season blooming with great nectar and pollen for the insects and hummingbirds and seeds for other birds. Plant these in masses in your yard or garden, along roadways and walkways, along fence lines and even in patio pots. The idea is to provide food as well as shelter for the pollinators by creating a habitat where they will be safe and well fed. Putting a shallow dish or plate of water out will be much appreciated and leave an area of dirt/gravel undisturbed for nesting native pollinators. Keep some dried branches and canes from tall plants around. Look at your local garden centers for Mason Bee boxes or create homes for native bees yourself out of easy to come by materials. Leave your stalks from your milkweed plants standing or at least keep them around until the Monarch eggs have hatched and the larval caterpillars have found their way to the new green plants. The new “Honey Source” Honeybee Wildflower mix was specifically crafted for the beekeeper and honey maker in mind, as well as any type of gardener who wants honey bees to thrive. The blend includes 19 honey bee favorites such as Rockcress, China Aster, Siberian Wallflower, and Rocky Mtn. Penstemon to name a few. These pollinator-friendly species were selected for their honey-enhancing properties. Our “Bee Rescue” Wildflower mix has been designed to include the absolute best species to support the health and vitality for a wide range of native pollinators as well and the honey bee. These are the flowers that attract the most pollinators and will do well over the most growing zones. This blend includes flowers such as Cosmos, Gaillardia, Cleome, Rockcress, Fleabane and Monarda and many more. 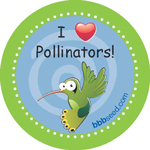 I Love Pollinators stickers available for purchase. Hummingbirds are attracted to bright colored tubular flowers. Hummingbirds can seed red colors whereas bees cannot. The wildflower mix for Hummingbirds contains the vibrantly colored, nectar-rich species that hummingbirds love. Species include Perennial Lupine, Firecracker Penstemon, Foxglove, McKana’s Columbine, Russell Lupine, Rocky Mountain Penstemon, Scarlet Flax, Standing Cypress, Beebalm, and others. The mix, Wildflowers to attract Butterflies and Birds is specifically designed to provide a succession of blooms to provide forage for the butterflies (as well as other pollinators) and to provide seeds for the birds in the Fall.